Learn public speaking with humor. In the corporate world, we've all sat through boring presentations. Some of us have been in the unenviable spot of giving a presentation. The thought of speaking in front of people can bring terror or anxiety. For others, it doesn't bother them at all. 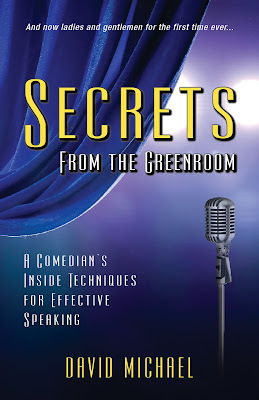 However, no matter what your feelings are before you speak in front of a crowd, you can benefit from Secrets From The Green Room by David Michael, who teaches public speaking with humor. After completing his degree in Communications at the University of Pittsburgh, David Michael wound up performing in a talent show. One success led to another and soon he was performing as a standup comedian. Over the next 20 years, Michael performed with some of the biggest acts in the business, Drew Carey, Ray Romano, Jay Leno, Howie Mandel, Tim Allen and more. During his two decades on the road, Michael learned through experience and from the tutelage of some of comedy's greats what it takes to fully engage an audience. Thousands of shows and miles later, Micheal began to seek some balance in his life and limit his time on the standup comedy circuit - which is a very hard and draining lifestyle. Working in the corporate world for the first time since graduating from college, he started to see a real void in the many presentations he was required to attend. He saw people with interesting content, but lacked the delivery skills to fully connect with their audience. Yawning, droopy eyes, people fiddling with their cell phones, texting, looking around for the exits were things he spotted that he knew the nervous speaker was probably observing, too. In Secrets From The Green Room, David Michael tells you step-by-step how to incorporate humor into any presentation. You'll also learn tricks that only comedians know on how to set up a room, seating for best results, presentation materials, how to overcome fear and more. What makes this book special is that it is the first written by a standup comedian for a corporate clientele. Comedians are under tremendous pressure to produce results - laughs. They also work in foreign environments where no one knows who they are and in many cases do not care. Skills that can take a room full of strangers into a focused audience of engaged listeners is what you'll learn how to do in this book. Most corporate speaking engagements are not as challenging, but you will learn what it takes to win over a room and have them remember your presentation and be asking for more. If you think you've had a tough presentation at some point in your career, you'll howl at Michael's recounting of his week-long tour performing at prisons in Pennsylvania. He went from bombing the first night, then worked toward successfully assessing his audience and was a hit by the end of the tour. Even the pros face adverse challenges - but a prison gig? That makes talking to your sales force a lot easier, doesn't it? Secrets From The Green Room is an easy read and is perfect for any organization. Everyone you have in your company that is required to speak for 10 minutes, 20 minutes or more should have a copy in their hands. Something as simple as opening with a good joke can change the mindset of a crowd and get them to be more attentive and wanting more. But David Michael's book goes much farther than just teaching you how to open your presentation with a joke. He tells you why audiences respond the way they do and what factors can impact a presentation. Secrets From The Green Room will be available on Amazon.com but can be ordered individually or in bulk from David Michael's website. Michael is also available for corporate speaking engagements where he can work directly with the people you need to be the most effective communicators in your organization. 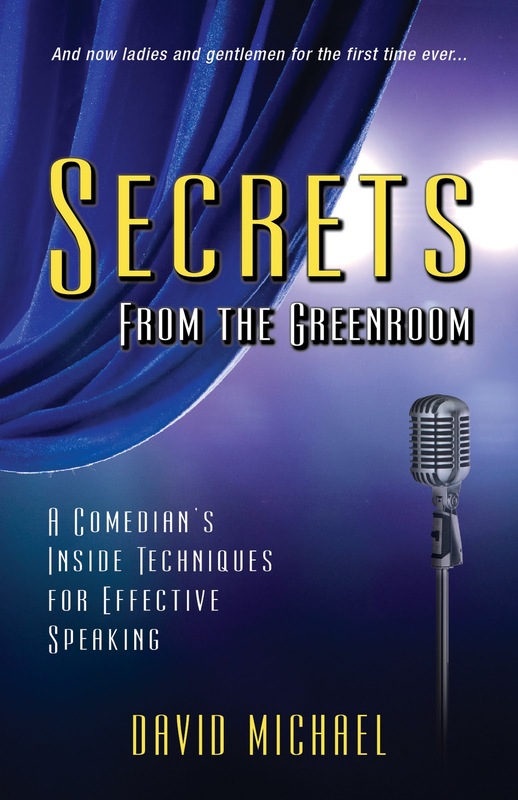 If you're looking to learn public speaking with humor, Secrets From The Green Room by David Michael, a seasoned comedy pro will lead you to your first of many laughs and more effective presentations. Key To Life And Success Hidden In Blue Man Group Song - "Time To Start"